My youngest daughter, Roberta, was around four or five years old when she decided my husband, Iain, needed a toy to take to work with him. Her school had recently had a “bring your favourite toy to school day” and she thought it would be a good idea for Iain to do the same. The only problem was that the toy she had chosen was much too big, so we went out to look for a small teddy to go in his briefcase. We found a lonely green fluffy teddy about 7" high – the last one on the shelf! - and we bought him. Berta wrote note, in her best hand writing ("My name is Briefcase Bear I am here to be your friend!") and we then snuck him into Iain's briefcase. What I didn’t realise was that Iain had an important meeting first thing the next day, so the well-intended gift didn’t just surprise him but also his superiors sat next to him when he opened his case to find a tiny shaggy teddy with a child’s hand written note around its neck staring at him! Thankfully, Iain’s bosses have a sense of humour, and Briefcase Bear has gone everywhere with him since. 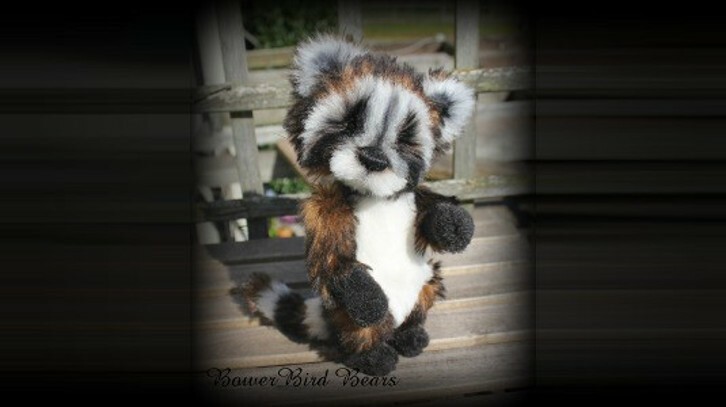 It was Roberta (now in her twenties) who suggested that the bears I had recently taken to making be called Briefcase Bears, a reminder of the intention behind that first little bear – a brighter start to the day, a companion that doesn’t argue or talk back, and more importantly, a friend at work to cheer you up. Beppo is a 14 inch bear made from Italian viscose filled with a combination of wood wool, heavy weight polyester and steel shot. He is dressed in a hand made outfit. 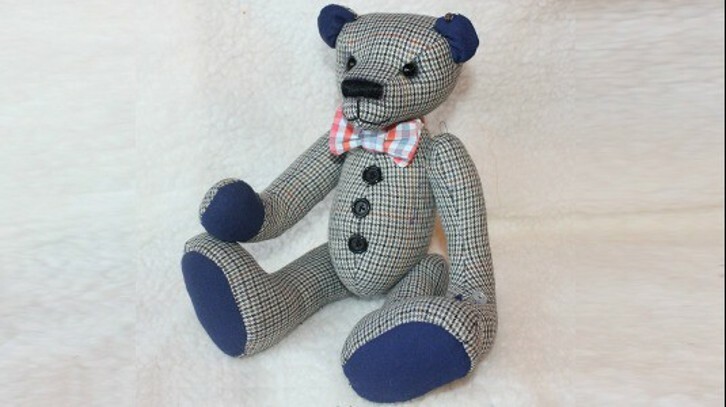 Hubert is 14 inch high made from Abraham Moon textiles, he is accessorised with Irish linen winged collar and bowtie made from Liberty of London textiles. “Fed” with a combination of wood wool, steel shot and carded wool from North Wales. He is fully jointed and has vintage boot buttons for eyes. Ambrose is 18 inches high made from Abraham Moon textiles, with hand knitted wool and silk mix scarf. “Fed” with a combination of wood wool, steel shot and carded wool from North Wales. He is fully jointed, has vintage boot buttons for eyes and a growler in his tummy. 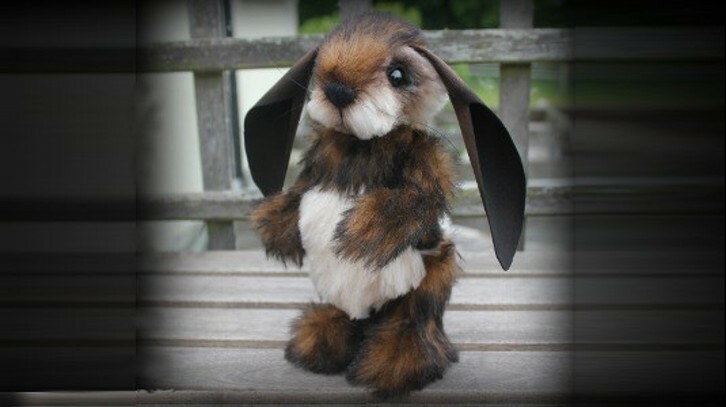 Beti is a 12 inches high and is made from mohair that has been hand dyed using red onion skins, she is dressed in hand made dress, fed with a combination of wood wool, steel shot and carded wool from North Wales. She is fully jointed and has glass eyes. 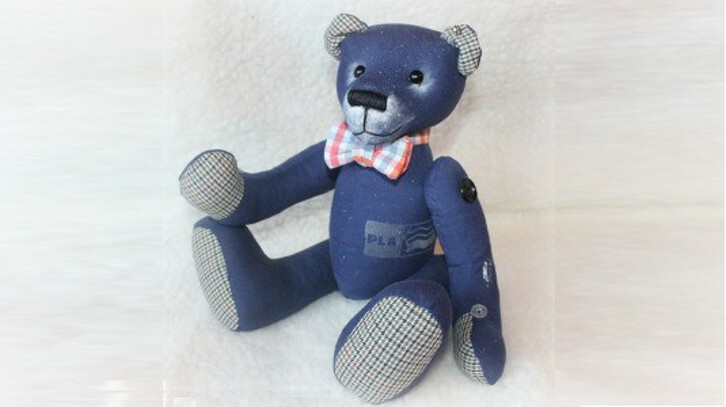 Ludovic is 12 inch high primitive style bear made from hand dyed mohair, using blackcurrants for the dye bath. 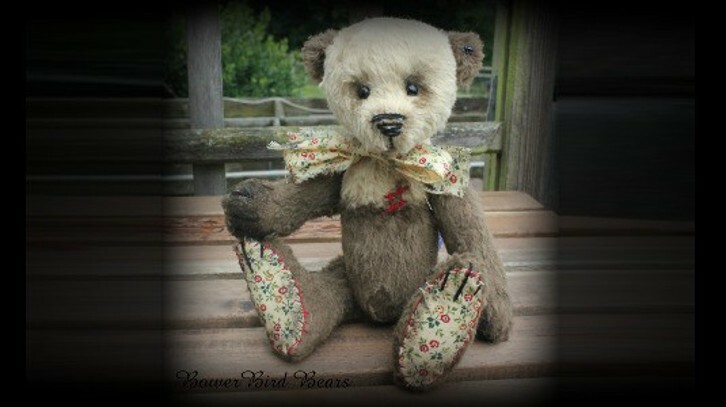 He has Abraham Moon paw pads and a ruff made from vintage French lace. To add to the vintage/ primitive look he has a destressed glass eye and one vintage button eye. 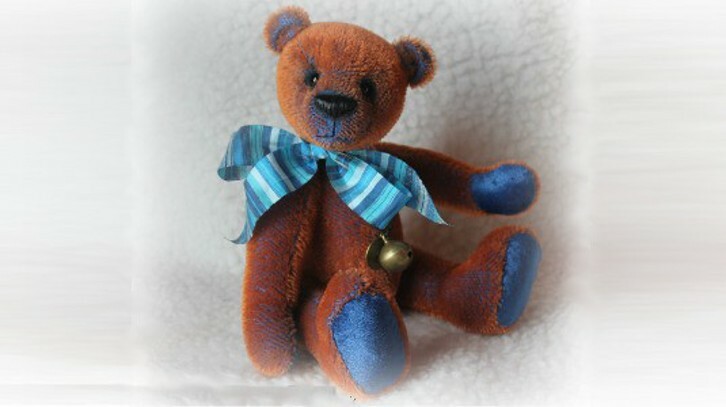 Malcolm is a briefcase bear ( Briefcase Bears are 7 inch high traveling companions who love to travel and share your adventures) made from hand dyed mohair using blackcurrants for the dye bath. He is dressed in a mohair and silk mix hand knitted scarf and hat. He is fed with a combination of wood wool, carded wool and glass pellets.